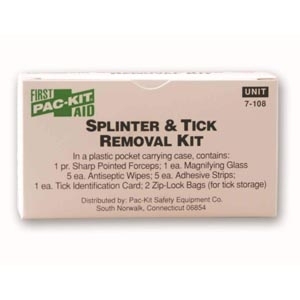 PAC-KIT SPLINTER & TICK REMOVAL KIT Portable spinter and tick removal kit fits easily into procket. Includes tick identification card to help protect against Lyme Disease. Includes essential supplies for easy splinter and tick removal. Comes with reusable plastic carrying case. Box fits easily into first aid kits or cabinets. Kit contents include: 5 adhesive strips 1 x 3"; 5 chloride antiseptic towelettes; 2 Zip-Loc bags for storage and identification of removed ticks; 1 magnifying glas; 1 steel forceps; 1 2-pack of Splinter-Out splinter removers.